This is in further response to your letter of May 6, to the Occupational Safety and Health Administration (OSHA) regarding clarification of the labeling provisions of the Hazard Communication Standard (HCS), 29 CFR 1910.1200. I apologize for the delay of this response. "The employer may use signs, placards, process sheets, batch tickets, operating procedures, or other such written materials in lieu of affixing labels to individual stationary process containers, as long as the alternative method identifies the containers to which it is applicable and conveys the information required by paragraph (f)(5) of this section to be on a label. The written materials shall be readily accessible to the employees in their work area throughout each work shift." Conveys the appropriate hazard warnings. We disagree with your assessment that "this new labeling criteria contradicts previous interpretations of labeling stationary vessels, as well as what is actually stated in the standard." As stated in the standard, any alternative labeling system utilized must convey the same information as a label required under the HCS. The preamble to the 1983 HCS final rule (see Federal Register, page 53304, November 25, 1983) states that "alternatives to in-plant container labeling should be permitted for all stationary containers as long as they present the same information required to be on container labels, and are readily accessible to employees in the work area" (emphasis added). An example of an alternative system, utilizing a code number, which would meet the intent of the standard may include the following scenario: a code or number, letter, etc., is the only identification that appears on a batch process vessel which contains chemicals that may change frequently during the process. The same code or identification appears on the batch process sheet, which is readily accessible to all the employees during each shift, while they are in their work area. The process sheet contains an appropriate hazard warning for that batch as required by the standard. Keying a code to the MSDS only, without keying the code to an appropriate hazard warning does not meet the intent of the HCS. 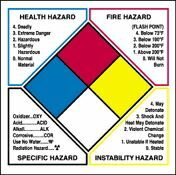 A material safety data sheet is not an "appropriate hazard warning"; the purpose of a label under the HCS is to serve as an immediate visual warning of the hazards associated with the chemical. The identity of the chemical leads to the more detailed information on the MSDS, but the hazard warning gives immediate information to employees working with the substance about the hazards associated with exposure. We hope this discussion is helpful to you and clarifies OSHA's intent behind the requirements of the HCS for labeling in-plant containers. If we can be of further assistance, please feel free to contact us again. The following is a request for clarification of the labelling provision of the hazard communication standard (29 CFR 1910.1200(f)(6)). It states that the employer may use signs, placards, process sheets, batch tickets, operating procedures, etc. as an alternative method for labelling individual stationary process containers. OSHA compliance officers have permitted labelling of stationary vessels with only a code provided it could be cross-referenced to the appropriate MSDS. This type of labelling also allowed for the easy identification of batch process containers, in which the contents changes frequently in a shift. This new labelling criteria contradicts previous interpretations of labelling of stationary vessels, as well as what is actually stated in the standard. What does OSHA consider to be appropriate labelling for stationary vessels? How should batch processes be labelled? Thank you for your letter of May 6 in which you seek clarification of labelling provisions of the Hazard Communication Standard. Since the issues you raise relate to compliance with the standard, I have forwarded your letter to Ms. Pat Clark, Director of Compliance Programs, for response.